A study in a hospital in Newark that serves a predominantly African American population found high rates of hypertension emergencies. Older black men were at higher risk of heart attacks and strokes caused by high blood pressure. The number of medical emergencies caused by extremely high blood pressure was five times the national average at a Newark, N.J., emergency department that serves a primarily urban, African American population, according to a new study involving Newark Beth Israel Medicine Center and the Rutgers University School of Nursing. That’s a sign of the need for more aggressive control of blood pressure and related problems like diabetes and kidney disease in older black adults, said Irina Benenson, a doctoral-level nurse at Rutgers who co-led the study with Frederick Waldron, an emergency physician at Beth Israel. The study was also the first to flag anemia as a risk factor for major complications of high blood pressure and raises questions about flaws in primary-care provision for high-risk patients. "Some may think that treating blood pressure in older adults increases their risk for complications, but actually it's the opposite," Benenson said. "Doctors should aggressively treat older adults." Benenson, who focuses her research on hypertension in minority populations, said there has not been enough work on the “extremes” of blood pressure seen in emergency departments, especially among African Americans. The three-year study set out to measure patients who came to the emergency department for any reason and also had hypertensive crisis, defined as a blood pressure at or above 200 over 120, and hypertensive emergencies. A hypertensive emergency was a severe increase in blood pressure along with a heart attack, stroke, fluid accumulation in the lungs, acute kidney injury, or a tear in the wall of a major blood vessel that supplies the heart. At the emergency department, where 90 percent of patients were African American, 11.4 percent of patients were in hypertensive crisis, a condition that is often symptomless, and 3.2 percent had hypertensive emergencies. The study was published in the journal Blood Pressure. High blood pressure — generally this means the top number is 130 or higher or the bottom number is 80 and up — is a national problem. 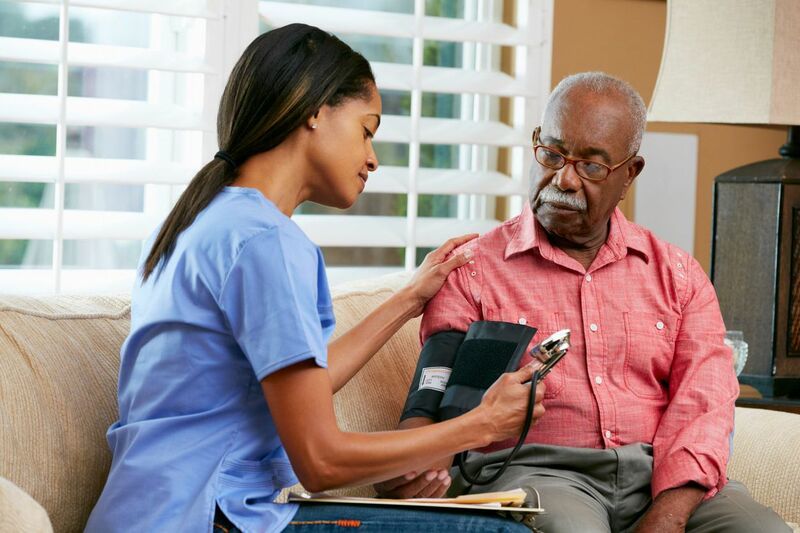 A third of U.S. adults have high blood pressure, but the problem is significantly worse among African Americans, of whom 43 percent have hypertension. It can often occur as part of a constellation of problems that threaten health: obesity, cardiovascular disease, diabetes, and kidney disease. These problems, Benenson said, can work together to cause emergencies like heart attacks and strokes. Why African Americans are at higher risk for these problems is poorly understood, but it is likely the result of multiple genetic and environmental factors. For one thing, the blood pressure of African Americans is more likely to be sensitive to salt in the diet than it is among whites. Poverty and racism contribute to stress, which can negatively affect how well the body functions. Access to healthy food can be a problem. Poor diet and lack of exercise are huge problems for Americans in general. The study found that the risk for emergencies caused by hypertension was highest in men over 65 with a history of coronary artery disease or heart failure, anemia, and chronic kidney disease. Irina Benenson is an assistant professor in the Rutgers School of Nursing. Anemia, which is common among people with high blood pressure, diabetes, and kidney disease, was a new risk factor. Benenson said animal studies have found that anemia stresses blood vessel walls, making them more likely to constrict. We may typically think of anemia as a problem caused by inadequate iron in the diet, but it’s more complicated in this population. The kidneys play a key role in the production of red blood cells in bone marrow. Kidney disease leads to a reduction in red blood cells. Chronic kidney disease and diabetes also increase inflammatory substances that can suppress utilization of iron, Benenson said. There are medications that can improve anemia in people with high blood pressure, but Benenson said the better way to combat anemia is to control diabetes and kidney disease. She said that, to prevent emergencies, doctors should be taking high blood pressure in older adults very seriously while independently attacking high blood sugar from diabetes and high cholesterol. Somewhat surprisingly, the study found that the emergency patients with very high blood pressure usually had insurance and access to primary-care doctors. That’s a sign that something about the way they were receiving care wasn’t working well, Benenson said. Many people covered by publicly funded insurance such as Medicaid are assigned a doctor they didn’t choose, she said. That could be working against forming the strong, trusting relationships that make patients more likely to follow their doctor’s advice. Doctors may also need more training in communicating well with older, African American patients. Benenson said she now wants to talk to patients — this study relied completely on hospital records — about why their blood pressure was not well-controlled. Waldron, she said, is also embarking on a program to improve cultural competence among young doctors at his hospital.